Wow. 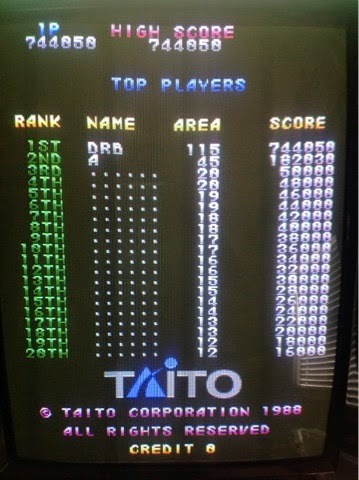 Now that's what playing nothing but Raiden II can do to your score on an old school Toaplan game! I was getting a bit tired of Raiden II, swapped in Garegga and got nowhere (I might actually not like this game) and popped this in and two quick credits later and damn - new high score! Tatsujin, if you haven't played it before, is old school Toaplan where memorization and fast bullets meet beautiful sprite art and an excellent soundtrack. It's tons of fun if you like brutal gameplay and small gains for lots of work. I love it. I'm also thinking of trying to get a copy of V-Five again as it's never got its due, even when I owned it previously. It's one of the few Toaplan titles I'd still like to buy, but they rarely come up for sale. Still, the pcb that's on its way here should be some excellent old school goodness -and one I have wanted for quite a while.